Halloween – Fun or Fakery? It is October now and of course this means that certain things occur. There’s the obligatory trip to the shoe shop for warm boots, wellies, and a top up of gloves, hats and scarves. There is conker hunting (great for kids and a worry for car drivers who now have to watch out for kids darting out into the road to grab that shiny just out of reach conker) and of course there is Halloween. Halloween or All Hallows’ Eve is observed around the world every year on 31st October. There is some debate regarding the origins of the festival as some profess that it has links to Pagan traditions, particularly the Celtic Samhain, while others claim that there are links to early Christianity. Today the reasoning behind the celebration seems to have been lost in sweets, costumes and ‘trick or treating’. Halloween is celebrated in a big way across the pond in North America especially. Over here in the UK, Halloween has become more established in recent years and everyone from the supermarkets to the schools get involved. I am torn about this holiday. Lord Dodo, who has now gotten over that incident where some sticky candy got stuck in his beak last year just before he was due to speak at a stationery event (most humiliating for such a proud bird), also has reservations about the day. While he is possibly not quite as anti-Halloween as myself, Lord Dodo has however decided to perch his feathery self upon the fence and ponder the Halloween debate further as he isn’t convinced with any certainty either way about the validity of the celebration. Don’t get me wrong, I am no Scrooge and adore Christmas and other holidays yet Halloween simply doesn’t do anything for me. As a mother I understand the excitement of Halloween. There are chocolate and sweets, pumpkins, bats and spiders and of course an array of fabulous costumes to choose from. There are parties and spooky cartoons, a whole host of art and craft projects to choose from and the internet is crammed full of babies’ bottoms painted as pumpkins. I get that it‘s fun for many, but for me Halloween has lost some of the glitter and I have seen a less than festive side to it. Trick or treating was not something I took part in as a child myself which has perhaps coloured my perception of the holiday. Many see it as a form of begging and knocking on doors after nightfall could be seen as a nuisance to some. Despite shipping my six year old son off to the annual Halloween party hosted by my in-laws, I choose to stay at home and not answer the door. I have no real issue with the cute skeletons and spiders that roam the streets with a responsible adult going to door to door with their family, however I find Halloween to be something of a useless holiday -especially after the fifteenth teenager* has hit my window and threatened some evil if I don’t cough up. 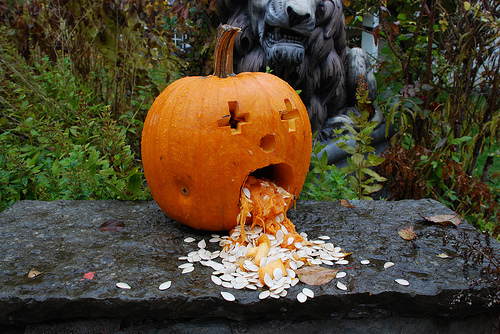 Halloween, a fun festival or a nuisance that has had its day? *Disclaimer: I am quite fond of teenagers as I used to be one once therefore am loathe to stereotype them. My opinion is based purely on the teenagers that I know locally who seem to be affected by Halloween the same way that a werewolf is by the full moon. As a pagen/wiccan I can say that “Samhain” or what the christians call halloween is a pagen festival. It celebrates the end of summer and the 3rd and final harvest. It is also our ” New Year”. All Hallows Eve actually falls on the 7th Nov. Samhain begins the Wheel of the Year. Thus, it is a time of death and rebirth. It is a time to remember and honor loved ones who have passed over to the other side. As for the customes you were, this actually stems from the early custom of making wishes on Samhain, similar to making New Year’s resolutions. Thanks Rachel. Funny enough I had a conversation with a dear friend of mine this morning who is very keen on all things Wiccan / Pagan (I confess that I personally know very little about it myself) who filled me in. I expect then that Halloween means very different things to different people. Do you think the way non-pagan people celebrate Halloween is very different to what it stands for, i.e. the message has been lost? All I see at this time of the year is special offer chocolate and sweets, lots of plastic and trick or treating which often gets out of hand. Another thing I don’t miss about moving from UK to France… no Trick or Treaters here thank goodness. People in UK feel like prisoners in their own homes, fearful of the damage that yobs can carry out to their property (houses and cars) if they ignored the knock on the door so they could beg. So is Halloween a non-starter where you are Steve? We don’t “do” Halloween, really. I’m not keen on taking my kids to peoples houses asking for sweets. Last year I answered the door last year to some teenagers who demanded money, instead of sweets, and who apparently went on to harass some eldery residents down the road, as well, so this year we’ve decided on a no opening the door policyl. I have no issue with someone celebrating Halloween as part of their culture/religion/beliefs, but it’s been utterly consumerised and Americanised, to be honest. Ps I apologise for the appalling spelling and grammar in my previous comment, I’m slightly tired, had no coffee today and my brain and spell check clearly aren’t working! No coffee whatsoever? This disturbs me more than fact that Halloween chocs have been in our local supermarket since mid-September! I hope you get your caffeine fix very soon.